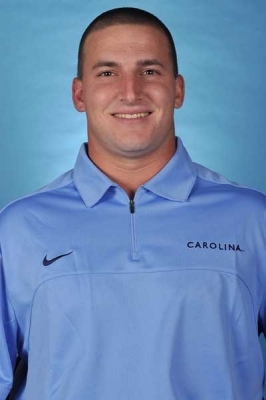 Hobbs Johnson — those were the first words out of UNC coach Mike Fox’s mouth at the post-game press conference Thursday night at the College World Series. And this left-hander, not N.C. State’s much-publicized left-hander Carlos Rodon, was the story of North Carolina’s 7-0 victory over the Wolfpack. Johnson gave up five hits and no runs over eight and a third innings while striking out six. Johnson hadn’t pitched in 10 days but his last outing wasn’t a good one as he gave up five runs to South Carolina in a loss. “The key to his game is pounding the strike zone to get ahead in the count early,” Fox said. While he planned to throw a lot of fast balls, the fact that the stadium is a pitcher’s park and the wind was blowing in on hitters made it even more important to not give up walks and get the batters to put the ball in play. Carolina hitters hoped to get the ball in play themselves as they were matched up against Rodon again, just four days after the All-America pitcher had stifled the Tar Heels’ bats. Rodon wasn’t the scheduled starter but he lobbied Wolfpack coach Elliott Avent and, with their backs against the wall in the elimination game, State decided to start its ace. In the fourth inning, the Tar Heels were able to scratch off Rodon as UNC’s Michael Russell hit a sacrifice fly to right that scored Brian Holberton on a close play at the plate. Rodon, who had committed a throwing error earlier in the inning, argued the call, as did Avent, but Holberton had gotten his hand on the plate prior to the tag. The Heels pushed across a second run off Rodon in the fifth. With two outs, Colin Moran, who had three hits on the night, singled in Parks Jordan on Rodon’s 75th pitch. Rodon was on an 80-pitch count and exited the game. Avent said he thought even with the Pack trailing 2-0 that they could come back late in the game. But, with Johnson breezing on the mound, the Tar Heels fared better against Wolfpack relief pitchers, tacking on four runs in the eighth and one in the ninth. North Carolina’s middle infielders, who were solid defensively, were the offensive stars of the eighth inning. UNC shortstop Michael Russell singled up the middle to drive in two runs to give the Heels a 4-0 cushion. UNC second baseman Mike Zolk doubled down the line in right field to drive in two more and break it open at 6-0. Moran drove in Jordan for Carolina’s seventh run in the ninth. Fox said Johnson’s command was key, walking only two batters. “That’s the best he’s thrown, and he’s thrown well for us all year,” Fox said. The Tar Heels face a UCLA team known for its pitching in yet another elimination game Friday at 8 p.m. EDT. During an in-game interview on ESPN, Fox joked that he knew Rodon, who was on just a three-day rest, was going to start. “I know Elliott better than all of you,” he said with a laugh about the State coach. Chaz Frank singled to lead off the game. It took five innings for the Heels to get a hit off Rodon Sunday. UNC reliever Chris McCue, who got the final two outs on a line-drive 9-3 double play, threw one changeup and it was supposed to be a fastball. That was the only off-speed pitch State saw the entire game. Of the 10 College World Series games this year, nine have been won by the team designated as the visiting team. The official attendance for the game was 25,742 and the game lasted 3 hours and 32 minutes.